Flipkart's pre-Christmas festival campaign, the Big Shopping Days sale, promises huge discounts and e-gift vouchers to buyers. Home-bred e-commerce giant Flipkart announced that it would launch its pre-Christmas promotional campaign, dubbed as the Big Shopping Days, this weekend. 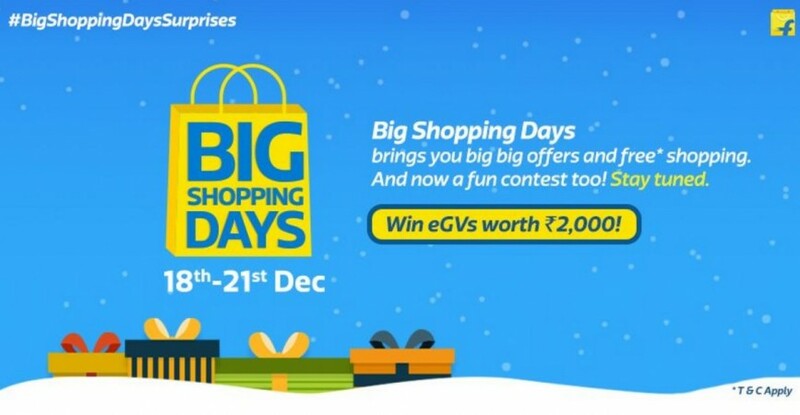 Flipkart Big Shopping Days sale will be held from December 18 to 21. The e-tail firm has opened a dedicated page to give a sneak peek on what offers fans can expect during the upcoming sale event. As per Flipkart's poster, OnePlus 3 smartphone, which costs Rs. 27,999 is expected to be priced under Rs. 20,000. Flipkart is also offering discounts on other popular devices, including Moto E3 Power (confirmed to get Rs. 500 off), Apple iPhone 6S series, Samsung Galaxy On8, Galaxy OnNxt, LeEco 2 and Lenovo K5 Plus and Phab 2. As far as smart wearables are concerned, Flipkart promises to offer Samsung's Gear Fit 2 for Rs. 9,990, Rs. 5,010 less than the MRP. Apple Watch and Moto 360 (2nd Gen) are also slated to get generous price cuts. Flipkart has promised that it would offer Samsung, Micromax and Vu-branded high-resolution smart TVs for less than Rs. 19,000. The e-commerce firm is also giving discounts on Apple Macbook Pro laptop, Skullcandy headphones, iPro powerbanks (10,400mAh), Xiaomi Mi powerbanks (10,000mAh) and Philips USB trimmer. Flipkart has promised to reveal the discounted price details of several other products on December 17. Watch this space for more news about Flipkart's Big Shopping Days sale.